Today is the 7th day of the beer advent calendar. One whole week has gone by with a new beer each and every day. It’s been quite exciting each day and I think this is something any beer lover should try to invest in if they can. We are sticking in the same region today for our 7th beer. While we had an Aussie beer yesterday we are jumping islands and finding ourselves in New Zealand. 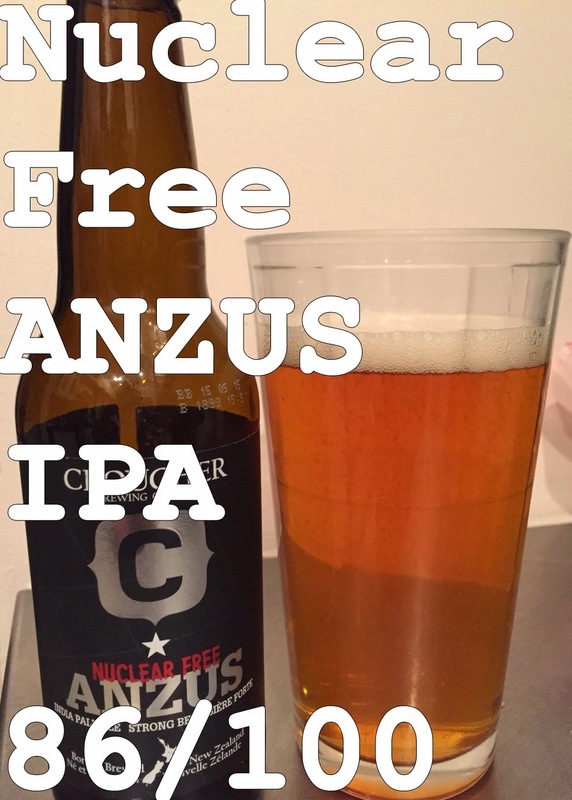 Today’s beer comes to us from Croucher Brewing Co and it is the “Nuclear Free Anzus IPA.” This is the first true India Pale Ale in the calendar. India Pale Ales are hoppy beers within the broader category of Pale Ale. They are lighter in colour and are incredibly unique as the variety of hops used and the hopping method can significantly change tastes. Croucher Brewing Co is located in Rotorua, a small town in the northeast part of the island near Lake Rotorua in the Bay of Plenty region of New Zealand. Rotorua means “second lake” in Maori - the full name being “Te Rotorua-nui-a-Kahumatamomoe.” It is best known for its geothermal activity, having many geysers, bubbling mud pools, thermal pools and the buried village (a village buried by the Mount Tarawera eruption in 1886). Croucher Brewing Co was founded by Paul Croucher. It began as a dream in the 1990s that slowly developed into a non-commercial brewery in 2004. Paul entered the Beer NZ brewing competition and won the non-commercial category. This gave him and his business partners, Richard Croucher and Nigel Gregory, the confidence to forge ahead as a commercial brewery. In 2006 they opened as a commercial brewery and in August of that year won a bronze medal for their Croucher Pale Ale. They have continued to grow over the years winning numerous awards and producing many styles of beer. The beer itself is an attempt to repair relations, so Croucher Brewing Co says. Let’s see what the “best hops” from these three regions can produce. Onto the beer! Appearance: Clear golden brown with a 1” head that dissipates slowly. Smell: Pear, apricot and green olive on the nose. Taste: The front is incredibly smooth, light bodied, with the pear, apricot and citrus coming through in flavor. The combination of hops makes for a unique taste that finishes with just the right amount of bitterness and leaves a sweet fruit taste on the tongue. Mouth feel: Smooth and light bodied. Overall: This is a very good IPA. The combination of hops from three countries is interesting and works. The flavor profiles of the hops work well together and provide you with a very well balanced beer. Do I like it: As I have said many times, I love IPAs. This one does not disappoint. It brings full on hop action that isn’t too overwhelming even for someone who doesn’t drink a lot of IPAs. The light body provides a crisp and refreshing beer. This is certainly a beer I’d buy and be happy to drink. This is a close second as my favorite beer so far.